Nethybridge – The annual residential trip for S1 was once again a great success. Thanks to the many staff who gave their time so generously. Also to Andy Vickerstaff and Paul Tattersall for their expertise. It was with relief that we did not have to visit Casualty this year! The S1 Group was excellent and seemed to enjoy all the activities ranging from walking, mountain biking, kayaking, climbing and gorge walking. Evening entertainment was varied and staff and pupils thoroughly enjoyed the fun of the dorm inspection and the ‘S1 has talent’ show. Mrs. Fraser, Mrs Smith and Susan Maclean, once again, fed the troops for the week, and their bedtime lullabies to the girls were much appreciated. Mr. Milner would also like to thank Liam, Neil, Becky and Roisin from S6, for giving up their valuable study time to accompany the S1 pupils. It was very encouraging to receive compliments from members of the Community in Nethybridge about the good manners of our pupils. Long may this continue! This whole event is seen as a very important contribution towards team building within the group and to the education of each pupil. View photos here. Malawi Backpack Appeal – S2 pupils are conducting the backpack appeal again this year. “We collect and send bags away to poor children with little school equipment and clothing. Each backpack goes on a long journey to Africa and helps the children with education and at home. The backpacks go by truck then travel to a big ship where they are then moved to Malawi in the south east of Africa. The children each get one bag. The bags have roughly the same amount of things inside to make it fair. Malawi is a very hot country with a lot of orphans. The people have a low life expectancy and they are low on daily resources. Mary’s Meals is an organisation that feeds over 37 000 children every day. It encourages poor children to go to school. We are hoping to get over 50 bags filled and we would be grateful if the local community could donate bags and small items like pens, pencils, paper, sandals, toothpaste, towels, rulers, sharpeners, and clothing.” Items can be handed in to the school or given to pupils over the next 2 weeks. READ more about what to do here. Welcome Packs – On Wednesday 21st May, S1 pupils spent the day preparing Welcome Packs for incoming P7 pupils, in what has now become an annual event. Working in groups to plan and allocate tasks, pupils made bookmarks, designed fun stickers, and wrote welcome booklets to provide new pupils with an “insider’s guide” to the school. This activity develops their skills in co-operation, teamwork and in working to a deadline whilst still preparing a high quality product. The final version of the Welcome Booklet, the stickers and the bookmarks, together with a school diary and a highlighter pen will be distributed to the new pupils on their first day at High School in August. Icebreaker Day – The Primary 7 pupils from all the associated Primary Schools came for their first official visit to the High School on the 22nd May. They spent the morning doing various activities, helping them to get to know each other and the school. The afternoon was spent in the Science department where they worked together to carry out a variety of different experiments. Many thanks to S5 pupils Meghann, Morag, Gareth, Elizabeth and Calum for coming in to help the P7’s. On Thursday 29th the Art Department joined with staff from the Music and PE Departments to put on an Expressive Arts Day for the incoming S1’s. The pupils worked in the three different departments and put on a short performance at the end of the afternoon to S1 and S2 pupils and staff. This is the first time such an event has taken place but we hope to continue this next year. Prizegiving – will be held on the afternoon of Wednesday 25th of June, starting at 1:30pm. We consulted parents about this change and many support this move. It will allow the whole school to be present at such an important annual school event. Parents and Friends of the School are welcome to attend. This year we are pleased to announce that Mr. Richardson will present the awards and be our Guest speaker to the pupils. As most of you know, Mr.Richardson is retiring at the end of this term, and this will be a fitting way for his service to be recognised. Staffing – On Friday 6th June Miss S McMillan will end a long association with the school. We wish her well and thank her gratefully on behalf of the many pupils that she has taught and supported over the years. On Monday 9th June, Mr A McSwan takes over teaching in the Computing Department and we are sure he will enjoy working with Gairloch staff, pupils and parents. As always accommodation is an issue – so if anyone has rooms or a let available from August please contact the Headteacher in the first instance. Dietician Tuesday 10th June at 5-6pm – We constantly hear about the effect of diet on children’s mood and behaviour and the advice can sometimes be confusing. A specialist dietician from NHS Highland will be in school to speak to parents and offer practical tips on feeding your family. (See separate advert) This is open to parents of all children in the community not just those at Gairloch High. Art Department. For three days Eleanor White and John McNaught, both of whom have led art courses in the school many times before, worked with a group of S3 pupils, and a couple of seniors, on a project called ‘Salt of the Earth‘. Gairloch is one of four Highland centres that have been chosen to participate in this project. In each place visual work has been produced, based on stories about a chosen local character. Our pupils worked in collaboration with the Museum and based their contribution on ‘Red River Fraser’ who apparently lived for some years in Canada, working as a lumberjack, before returning to his home in Lonemore early in the 20th Century. Our pupils’ work will be on show in Inverness, along with work from the other three areas, after the completion of the project later in the year. We also had a visit from the Edinburgh Travelling Gallery. The artwork was on display in a splendid new vehicle. The touring exhibition included work by eight different contemporary artists from all over the world and was all based loosely on portraiture and the figure. Pupils from S1 – S3 all had the opportunity to view the exhibition. In groups, they viewed the work and listened to informative talks from the gallery staff who explained much about the many fascinating and challenging pieces. On Wednesday the 21st May, we travelled to Inverness by minibus, courtesy of the Janitor, and arrived at the bus station at 8:50 and left promptly at 9:00. From there it was a 3.5 hour journey to Edinburgh on the Megabus. Once we had arrived in Edinburgh, we had a 15 minute walk to the youth hostel and checked in. We then went to Dynamic Earth, and then we went to the hostel and had dinner then went out to the cinema and watched ‘What Happens in Vegas’. After that we all watched to the penalties of the Champions League final through the windows of a pub. We went back to the hostel went to our rooms then bed. Thursday we had breakfast and went to Princess Street and went shopping then we went to the Museum on the Mound which was a money museum and we got to crack open a safe and made a policy of life assurance. We then went to Princes Street Gardens. Then at 1 o’clock we went to the Scottish Parliament. A lady came and gave us a talk on how the parliament works and what goes on inside the parliament. Our MSP Jamie McGrigor came to talk to us, and we got to ask him questions about anything we wanted. He answered all our questions and was very helpful and interesting. We got our picture taken with our MSP. Then at quarter past two we went up into the debating chamber. There we watched question time with the Education Minister. They were taking about how we should get two hours of P.E. a week. After that we went to get something to eat in McDonalds. At four o’clock we walked to the bus station and then got on the bus to Inverness. The janny took us back to Gairloch. It was very good and we hope future Modern Studies pupils will enjoy it as much as we did. Gairloch High School pupils Rhoda Tippet, Charlie Mays, Megan Crueize, Amber Fox, Shannon Stewart, Kayleigh Elder, Charmayne Fraser and Alex Warren were invited to the Wester Ross, Strathpeffer & Lochalsh Area Ward Forum meeting at Lochcarron Village hall on 19th May to present their piece of artwork. 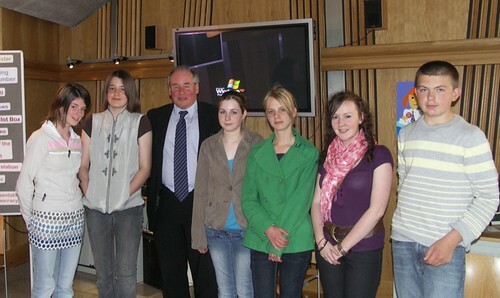 Other young people involved but unfortunately could not make meeting were Jess Ryan, Siannie Moody and Emma Potter. The Triptych entitled the “Wonders of Wester Ross” was created over 4 weekends made from each individual’s piece of work which all held a story about the area or young peoples experiences of living in Wester Ross with the assistance of Black Isle artist Lizzie Mcdougall. During the main ward meeting, Charlie, Megan, Shannon, Kayleigh, Charmayne and Alex individually stood up and explained confidently their artwork to the forum receiving huge praise and admiration from those present. Emergency First Aid Training – All S3 pupils, S5/6 Outdoor education class and some staff attended a first aid course prior to the May Holiday, provided by Martin Searle from “Outwardly Mobile First Aid”. Feedback from the pupils is (almost) unanimous in praise for a well-designed, interesting and useful day. We believe that this course is an exceptionally good investment. Bronze Duke of Edinburgh’s Award – Training in mapwork, camp skills and first aid is complete. S3 pupils were out last weekend on their first trip walking from Poolewe to Slattadale. This proved to be the usual trial of blisters, midges and sore shoulders under the weight of heavy sacks. Packs are always lighter on the longer and more testing routes that follow! See some photos of the pupils here. Campaign for Safe Teenage Drivers – We have launched a new campaign in an effort to keep our pupils safe when in cars. Read more details by clicking here. Internet Safety for pupils – On Wednesday 28th May Louise Jones, Health Promoting Schools Manager and Jim Henderson, Virtual Learning Co-ordinator for Highland Council will deliver an afternoon session in school for S2 pupils to consider the risks young people may encounter whilst using the Internet and other interactive technology. A presentation was given to parents at Gairloch High School on Thursday May 15th at 7.30pm. Details of the event and associated resources are available here. Medals in Highland Junior Athletics Event – In glorious weather 3 pupils, accompanied by Mrs Fraser and Mrs Morrison, took part in the Annual Junior Athletics Day at Queens Park, Inverness. Over 100 pupils from schools across Highland had the chance to come together and compete in field and track events. Anna Duncan was awarded 1st place in the 400m and 800m walking races and Charlie Mays took 2nd place in the long jump. Despite suffering from a heavy cold Gary Mackay insisted on representing the school and put up a good show against several older boys in the 100m, 400m running and shot putt events. Well done to them all. Last year Anna’s brother, Eadan, raised £180 in sponsorship by walking Beinn Alligin. The money raised contributed towards some additional swimming lessons for a small group of pupils last term. Thanks to the staff at the pool who provided excellent support for these sessions. Piping Success – Conal McDonagh did very well again in competition recently at Plockton. Up against some ‘piping genius’ he came 4th in the Strathspey & Reel and 3rd in the Piobaireachd. Not bad at all Conal!! Pupils involved in Trekking Centre success – Click here for the story behind this headline. SQA Exams and Study Leave – The final exams for S4/5/6 pupils have already started and we wish all senior pupils well in their respective examinations. Make sure your revision is thorough and do your best. S6 pupils ended their time at school with a meal out and a camp at the beach. After the event S6 pupils returned to the beach to make sure that any mess was properly cleared. It may be worth mentioning that study leave is not a school holiday or work time. Pupils are given time in a place of their choosing (home or school) for private study. Young people are not allowed to work during this period and employers could be in breach of the law if involved. Nethybridge – S1 pupils, and accompanying staff, return after a week in the Cairngorms. Click here for photos. Thursday 22nd May all P7 pupils visit the High School and take part in our “Icebreaker day”. On Thursday 29th May P7 have an Expressive Arts Day organised by Art, Music and PE staff. That evening P& parents are invited to the High School at 7.30pm. Finally on Wednesday 11th June all P7 pupils return to the High School for a day that introduces them to the timetable and new classes. Click here for all dates on the current calendar. In spite of the glorious weather a few parents turned up on the evening of Thursday 15th May to find out more about how to keep their children safe on the internet. Louise Jones, Health Promoting Schools Manager and Jim Henderson, Virtual Learning Co-ordinator for Highland Council gave a stimulating and valuable talk with some hard hitting facts. While supportive of the benefits of the the internet and associated technology it was clear that care is required and it is important that our children are aware of the risks. Do you know that when using interactive technology, such as mobile phones, your children can have unfiltered access to the internet or that they can have their mobile hacked via bluetooth? More importantly do they know. Highland have produced an E-safety information sheet. S2 will be getting a talk on Wednesday 28th May on this topic. Mr Port is grateful for the support of the Parent Council at this event. It was advertised here and letters were distributed to parents via pupils. Thanks also to Two Lochs Radio for advertising the presentation over the last week. Training in mapwork, camp skills and first aid is complete. S3 pupils were out last weekend on their first trip walking from Poolewe to Slattadale along the Tollie path. This proved to be the usual trial of blisters, midges and sore shoulders under the weight of heavy sacks. Packs are always lighter on the longer and more testing routes that follow! See some photos by clicking here. Last week, the school launched a new campaign in an effort to keep its pupils safe when in cars. All parents of S5 and S6 pupils have been sent a copy of a booklet that includes a contract which parents are being encouraged to agree with their sons and daughters to reduce the risk of them having road accidents. The school, supported by the Parent Council, feels that this is an important issue because road crashes are the leading cause of death of 15-24 year olds and one in five teenage drivers has a crash in their first year of driving. The risk of death in a car crash is three times greater on a rural road. Read more here and download the booklet. Pupils have been given letters at school to take home inviting parents to the following meeting next week. Louise Jones, Health Promoting Schools Manager and Jim Henderson, Virtual Learning Co-ordinator for Highland Council will be speaking at Gairloch High School on Thursday May 15th at 7.30pm. This event is open for all parents to come and find out more about how to support their children stay safe on the Internet. The ThinkUknow resource has been developed by the Child Exploitation and Online Protection Centre (CEOP) and has been designed to be emotionally engaging. It is very interactive and uses a number of powerful short films to educate and inform young people about the risks they may encounter whilst using the Internet. Importantly it also seeks to empower young people to know how to problem should it arise. All parents are invited to this relevant and potentially interesting evening. Global Teacher – We announced Dr Caley’s success in being selected to go to Malawi this summer to work. Read more details here of what she will be doing. Highland Council have also issued a Press Release today. School Chess Competition – This took place before the Easter holiday and was flagged up on the website but you may have missed the news. Click here. Duke of Edinburgh pupils meet Prince – Seven, very smart looking pupils (Liam Ross, Neil Macleod, Roisin Somers, Sam Mackenzie, Jennifer Port, Meghann Richardson and Calum Milner) proved a credit to themselves and their school when they met the Earl of Wessex on his visit to Tain on the 22nd April. They were there to talk about their Duke of Edinburgh’s award experiences. The Earl was especially interested in the Gold kayaking expedition, which visited places he was familiar with from his holidays on the royal yacht Britannia. Several people on the day commented that our pupils were fortunate to have such a wide range of opportunities available to them. That is entirely thanks to the support of staff, parents and other members of the community who help in this worthwhile programme. Click here for more info and photos. Jennifer and Calum were interviewed by Two Lochs Radio. Pupils talk at STUC Conference – Ms Velt took three Higher Modern Studies pupils to Inverness on 22nd April. Anna MacLean, Morag MacIver and Kerry O’Brien addressed the Annual Scottish Trade Union Congress at Eden Court. Their nerves did not get the better of them and they presented excellent speeches to the Trade Union delegates and around 100 pupils from other schools in the Highlands. Their speeches were on alternative energy policies, the national minimum wage for 16 to 18 year olds and international human rights. The girls were presented with a trophy for the school. Well done to the three of them! Morag and Anna were interviewed for Two Lochs Radio. Alisa Harding, West Highland Adventure gave each group an hour of problem solving, team building and communication activities. The Forestry Commission Scotland activity, from Shona Amos and colleagues, had pupils making bird feeders and whistles, racing in wooden sedan chairs and toasting marshmallows on a fire. Scottish Natural Heritage team of Nicola Tallach and assistant had the pupils leading one another blind folded to hug a tree, making a sound map to plot bird calls, wind/tree noises and construction work! Calum Mackison, one of our outdoor education pupils did a session on the navigation skills of pacing a distance and walking on a bearing. Our own Mr Richardson originally introduced this activity at Slattadale for DofE training. Our thanks go to all who assisted our staff deliver this day including the school canteen staff who provided an excellent sandwich lunch for our guests. Special thanks to John Campbell, Scottish Water, who saved the day at extremely short notice by solving a water problem. Click here for photos of the days events. Three of the pupils involved Maddy, Kerry and Allanah were interviewed for Two Lochs Radio. Last month representatives from SNH, Forestry Commission and National Trust for Scotland spent the day in school talking to all our pupils about our local environment. Over the last two weeks all S1 and S2 pupils have had the further chance to visit the Beinne Eighe National Nature Reserve at Kinlochewe. Pupils got a tour of the Glas Leitir Trail and heard stories of deer management. Back at the Field Station they planted up seeds that will join more than 30 thousand other young trees being planted out this year by SNH. Click here for photos of the days events. Three of the pupils involved were interviewed for Two Lochs Radio. Indoor Rowing success – AGAIN! The final results of the Concept 2 Indoor Rowing Schools’ League have been announced. This has been running for the last six months, with a different rowing challenge each month. Results are entered via e-mail. Our teams are to be congratulated for their consistent and persistent performances, which have seen off challenges from some big independent schools from down South. • Staff women (4) – 3rd from 23 – bronze medal! • Staff women (8) 1st from 8 – gold medal and trophy! Thanks once again to the Great Wilderness Challenge for providing the rowing machines last year, which continue to be a great hit with the pupils. Inter House Girls Football Competition – In the senior girls’ competition: Maree came 1st, Tollaidh 2nd and Kerry in 3rd. Girls junior competition the same order – Maree came 1st, Tollaidh 2nd and Kerry in 3rd. Well done to all girls who took part and thanks to the referees, Lewis MacIver and John Mackay. In a close senior boys’ competition, Maree were the winners, followed by Kerry in 2nd and Tollaidh 3rd. Tollaidh took maximum points in the junior competition with Kerry 2nd and Maree in 3rd place. Well done to all participants and thanks to the referees, Mr Gorman and Mr Cummings. Thanks also to Mrs Johnston who supervised and organised the events. British Handball Training – Last issue we reported that Judith Matheson and Flora Stevens have been selected to take part in training for the Scottish Handball team. This was a mistake as it is actually the British team. And now Judith’s sister Margaret has also now been invited to participate. Last week the three went down to Liverpool to train. Mr. Port is looking forward to Olympic medals coming to Gairloch in the future – so no pressure girls! Staffing News – Congratulations to Mr. Andrew Johnston who was recently appointed as Principal Teacher Pupil Support. He will take up post in Gairloch High in August. More details on the changes nearer the time.